I received a number of questions arising from my articles on night fishing, about trout’s night vision. In general a trout’s night vision is very good, even on the darkest of nights. There is some evidence that trout’s vision actually changes to black and white in the dark. One thing that is key to a trout’s night vision is a strongly enhanced ability to detect contrast and silhouette. So it is probable trout will stay lower in the water than the likely prey. Looking up towards what light there is, will make it even easier to detect prey. So trout may spend most of the night near the bottom of the river, or lake if in the shallows, looking up to locate prey. What light there is, (and there always is light, it is just that humans can’t see it) will silhouette prey or your fly against, or on, the water surface. 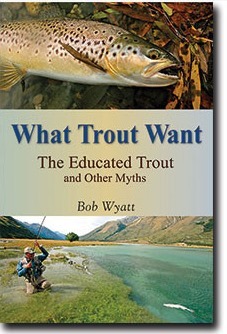 It is possible that trout can see larger prey easier at night; think baitfish, frogs, mice and large dry flies. Larger fish, say trout over 5 or 6lbs, seem to do much of their feeding at night. It is probable that this is more true of big brown trout than rainbows, and it is my experience, and the experience of my fishing circle, that big trout, browns and rainbows, are more often caught at night than in daylight. (14lb night-caught brown alongside). While the above is related to night vision, ‘the lateral line’ should not be forgotten. The sensors along the lateral line can pick up tiny signals from prey, and when combined with night vision, all help a trout find prey.